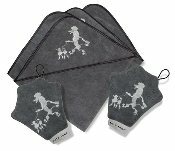 Pamper your pet with our soft microfiber terry hooded bath towel. Embroidered lulu jane motif on hood. Size: 29"x29" Color: silver gray with white embroidery accent motif.